Manual measurement will be different about 1-3 cm (0.4-1.2 inch). excellent quality, all like in the description, straight stitching, there are cup, only shortcomings is long, but it is small things. seller responsive, thank you for quality! very nice! CARVING perfect my CARVING brazier Is 36 b & m fashion i stick good! fart 60 kg and mido 1.63! superb one, my girlfriend like it, fitted well.. Thank you so much seller.. Product very much! Material good, tight, have insert breast. Support is fine. Delivery fast. Size S fit on my 42y. The time exercise after delivery thank you! Amazing!!! IN Moscow to re-measure a bunch of tops, but pick up failed, and the village is great, cup in place, you can change. The chest measurement 88 and under bust 72 s took-fine. Highly recommend. Material synthetic, but nice. Quality embroidery Super!!!! Found a couple of joints. Its worth the money. Shipping a little more than a month. Very surprised. Very good material, thick, quality, there is no smell. Sat well, inside the ear with pushapom (can be removed). Size 75a M taken. Super! All seated firmly. For the gym is a fire, the quality is good! No stocks. It for about a month. Top high quality, not, wear no cups pulled out immediately, usually wear M, 42-44, could be taken S too would be better than sitting) fabric very thick) satisfied with! Delight! The expectation of the order was only 17 days to St-Peterburga. The quality is excellent. Size L well fit the size bra 95C. Recommend to buy from this seller. 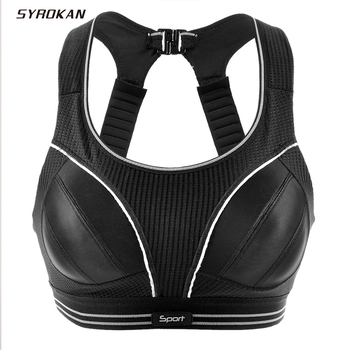 Cool bra for fitness, suitable for running. This is my second bra, first I ordered Blue! Fits well, retains its shape after washing, very carefully and well-cut cups are removed. Thank You Very Much! Satisfied with the quality! Arrived very quickly. As normal. Super! Meni podobaєtsya I cup garnі))) In Up posilka priyshla 3 tizhnі. Seller recommend.